Crossed Warps: Who are we? My name is Belinda and I am a textile artist. I have set this blog up with my friend and colleague Mel, Mel is also a textile artist. We concentrate on weaving as our main medium. Mel weaves on a AVL computerized loom, I on the other hand weave on a dobby 16 shalfs. I also have a Tokia 8 shalfs which is fun and simple to use. Mel and I met a ANU textiles when we were both studing. WE want to use this Blog as a way of sharing ideas and hopefully we also want to set up webcams in our studios and talk while we weave. 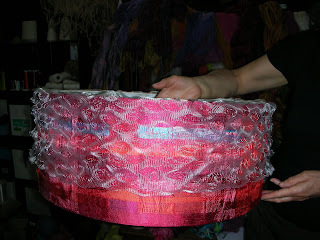 Here is a little sample of a Light Mel wove as a comission for the Campbell Town Gallery (I think for their Restaurant).